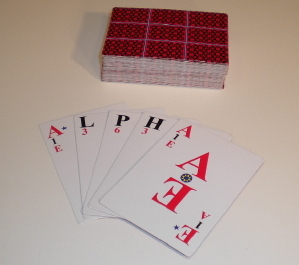 Alpha Playing Cards are the card component of the Alpha Word Game System. They can be used with other components of the game system to play games or by themselves to play games. There are already several different games that you can play with a deck of Alpha Playing Cards and more on the way. The current version of Alpha Playing Cards are technically called Alpha Playing Cards 2.0 and are based on the original Alpha Playing Cards. If you would like to see the current games you can play with a deck of Alpha Playing Cards go to Games. If you would like to print out and make your own deck go to Download. A deck of Alpha Playing Cards from the Game Crafter. When the vowel cards are used as marked vowels there are 6 A's, 9 E's, 6 I's, 6 O's and 3 U's available in the deck. When the vowel cards are used as semi-wild there are 12 of each vowel available in the deck.